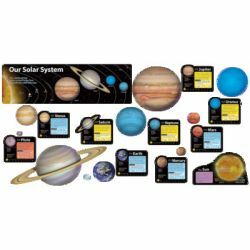 Large NASA photo planets are diecut for an impressive room decoration that teaches. Learn about asteroids, comets, and more. Set meets National Science Teacher Association (NSTA) standards. Includes English and Spanish Discovery Guides filled with information and activities. 21 pieces, up to 36" wide.